Liberia seeks 6000 teachers from Nigeria – Royal Times of Nigeria. 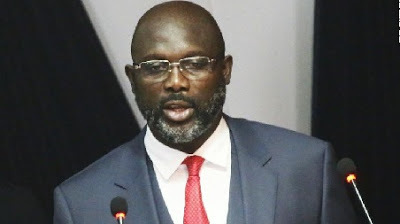 President George Weah of Liberia has appealed to the Nigerian government to send 6000 teachers to his country as part of the Technical Assistance agreement between the two nations. Speaking on Monday shortly after a closed-door meeting with President Muhammadu Buhari at the State House Presidential Villa in Abuja, Mr. Weah said his government inherited many problems which can only be tackled with assistance from countries like Nigeria. The Liberian leader identified some of the urgent problems facing his country as youth unemployment, as well as the need to revive the education, agriculture, mining and health sectors. He said, “Our people have voted for change, and for hope. And change is finally here. But mere political change is meaningless without development, prosperity, and growth Your Excellency, we need Nigeria’s help to jump-start our economy. You played a major role in bringing peace to Liberia you reformed our Army and today it is performing it duties to the highest professional standards. As we speak, they are serving in a peace-keeping mission in Mali You have also built and expanded the capacities of Liberians in so many ways. For example, during our recent observance of Armed Forces Day in Liberia, we were informed that two of our military personnel will soon be graduating as pilots from one of your esteemed institutions. We would like to see a continuation and expansion of that program, women. for both men and My administrations’ Pro-Poor Development Agenda, is intended to tackle the many economic and social problems that my Government has inherited, especially in addressing the large fiscal and infrastructure deficits, the urgent problem of youth unemployment, and reviving the education, agriculture, mining and health sectors. Your sustained technical assistance for capacity building in these sectors is most welcome. For example, Nigerian teachers and medical volunteers to Liberia, under the Technical Assistance Corps TAC) Agreement with Liberia, have been very crucial in boosting capacity development in Liberia, and it is my hope that this assistance can be considerably increased to address with urgency our most pressing socio-economic needs at this time. More specifically, under the Bilateral Teacher Exchange program, we are seeking 6,000 plus teachers to make up for the shortage of good teachers in our educational system. n agriculture, we are seeking experts and extension workers to build capacity in the sector, particularly with crops, (such as cassava, for example,) which lend themselves readily to value- added propositions and export earning potential. Liberian banking sector is dominated by Nigerian banks, and I am made to understand that their head offices in Nigeria may be considering reducing their support or even shutting them down because of the recent downturn in our economy. If this is true, l urge them not to do so, as l am optimistic that trade and commerce will increase in the near future, There are also major shortcomings in the electricity and power sectors, in road construction, in housing, in mining, and in fisheries, to name a few, that could be of serious interest to Nigerian investors, either as individuals or companies, or through joint-ventures or public-private partnerships. We invite all of you to come to Liberia and explore the many new opportunities for investment that are bound to increase under this new politieal dispensation I promise you that you will find a government that is not enly business friendly, but ready to do business’‘.